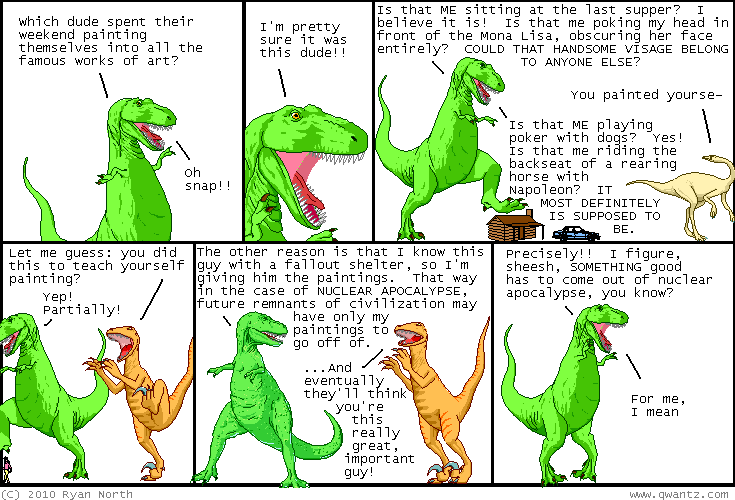 Dinosaur Comics - June 1st, 2010 - awesome fun times! –That's right, I said it! Ghosts are blind! June 1st, 2010: If you want to see a mobile-friendly version of my site, add ?mobile=1 to the end of the URL! There's also a iPhone version that Brian helped me with, available if you add ?mobile=2 to the end of the URL. If you click those links on a non-mobile device though, the site is just going to look dumb, and that will just be TOO BAD. In a few days I may make the site go to those pages automatically when accessing on a mobile device, so heads up! GUYS I forgot to mention - if you click the date on the mobile version of the site then stuff happens!